Tornado, the market leader in agricultural fencing, is introducing a new strawberry net for fruit growers. This innovative Tornado product enables producers to save costs and increase productivity, whilst also growing a higher quality product. Tornado has brought its expertise, which it has gained from over 40 years as a fencing manufacturer, to bear on eliminating the problems associated with traditional solutions for growing commercial strawberries. These methods can leave fruit vulnerable to pests, disease or damage and are time-consuming and labour-intensive. At a time when there is widespread concern about the availability of fruit farm labour due to the potential effects of Brexit, producers will welcome any technical innovations which will help them continue to grow their businesses. Tornado Strawberry Net comprises a durable steel wire net formed on site to provide a secure cage, in which growbags are placed. The design of the net removes the risk of the plants falling out or being knocked out and getting damaged, which can be an issue with plain wire systems. It also improves on the traditional method of growing strawberries in the ground, where it is more difficult to monitor nutrition and watering. Ground-grown plants are also more prone to pests and disease. 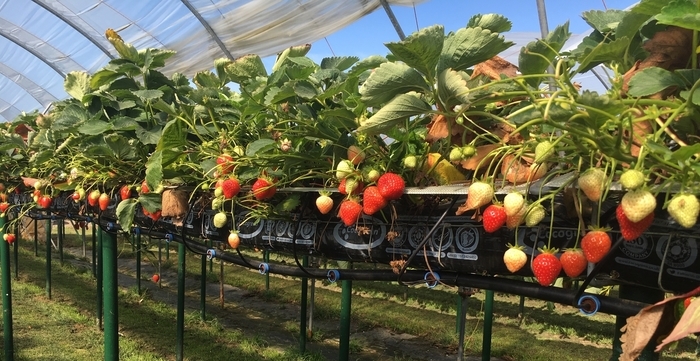 The Tornado Strawberry Net supports the plants off the ground, making the crop easier and quicker to harvest, and leading to time and cost savings for the grower. Manufactured from durable high tensile steel, the Tornado product does not suffer rot which can affect wooden tables sometimes used by growers to support the plants off the ground. It also provides a much more cost-effective solution than using metal troughs.